GERMANY: As the government speeds towards auctions for wind support, the industry is concerned what will happen to small onshore projects and whether offshore developments will receive a fair share. A system of auctions will be in place by 2017, although the tendering system for offshore wind will effectively only apply to capacity built after 2020. The onshore and offshore sectors present contrasting challenges. The high volumes of up to 5GW per year in the onshore sector could make competition difficult due to the large number of sites to be found each year. In the offshore sector, it will be a struggle to ensure competition in a market capped by the government at around 800MW — or only roughly two projects — per year in the decade through to 2030. If generation costs alone were the decisive factor, it would seem inevitable that projects in the high-wind coastal regions of northern Germany would sweep the board in onshore wind auctions. And the nearer-shore projects in the Baltic Sea would likely beat North Sea offshore projects that are further from shore. But there is much more to the matter than pure generation costs. Until now, the German state has set support rates for renewable electricity generation, controlling expansion of onshore wind by regularly decreasing the support rate, depending on how much installed capacity has exceeded an annual expansion target. The Renewable Energy Act 2014 sets the onshore wind growth target at 2.4-2.6GW per year, after accounting for dismantling and repowering. But the European Commission's guidelines on state aid for environmental protection and energy 2014-2020 require EU member states to grant aid for renewables "in a competitive bidding process on the basis of clear, transparent and non-discriminatory criteria", starting from January 2017. The obligation can be waived if member states demonstrate that only one or a very limited number of projects or sites could be eligible, or that a competitive bidding process would lead to higher support levels or low projection realisation rates. The guidelines allow exemptions in the form of so-called de-minimis arrangements. Small installations — for wind, those producing less than 6MW, or with up to six turbines — can be exempted from participating in competitive bidding processes. On top of that, projects below 3MW or with up to three turbines are considered to have less potential to participate in the wholesale market and can continue to benefit from any form of aid, including feed-in tariffs set by the state. So far, the German government has not signalled that it intends to allow these exceptions. Its 2014 act closely follows the EC guidelines by requiring that the auction mechanisms for renewables be transparent, non-discriminatory and competitive. The German law adds another key requirement, however: that the mechanisms must ensure the existing wide variety of players be maintained in the onshore and offshore wind sectors, as well as other renewable-energy fields. This aspect is seen as vital to allow citizens' involvement in the expansion of wind energy, which in turn helps maintain public acceptance for the big changes and costs involved in the Energiewende - the transition to increasing reliance on renewable energies in the German energy supply. Given the experience of auctions elsewhere, German wind-energy organisations are sceptical of the success of tendering. Brazil's auction results have shown a downward price trend is not guaranteed: after auctions began in 2009, prices bottomed out in December 2012 before heading upwards. Experience in South Africa shows auctions do not necessarily maintain a high level of competition, according to a study titled "Tendering models for onshore wind — experiences from abroad" carried out by consultancy IZES for German wind energy association BWE. In view of such findings, setting the support rate with an auctioning procedure is the wrong instrument to use, said BWE. "We don't believe in the success of tendering and would prefer, if possible, to avoid it, but there seems to be no choice, and so we have devoted much energy to find a model that could actually work," said Ronny Meyer, managing director of German regional wind energy agency WAB, at a recent offshore wind event. BWE, WAB and other renewable bodies have therefore decided to contribute to the design of the auctioning mechanisms from the beginning rather than protest later over government-produced concepts. Under the second option, the project developers — who have funded the developments so far — would have to relinquish their projects and be compensated for an as-yet undefined sum. The resulting pool of projects and players would be subject to the wiles of the auctioning body, which would choose which projects to put up for auction, in general, starting with those closest to shore. The previous owner is compensated for the development, ultimately from the player who wins the auction. This way the auctions find who can build the cheapest on a particular offshore wind site. This process therefore involves two stages: developers lose their projects, then the auction allocates projects to developers, with accompanying subsidy. For the onshore sector, the BWE argues that the annual onshore wind tendering volume will need to be as high as 5GW per year. This is required to take account of repowering old projects and that some projects that win support allocation in the tendering are not implemented; to ensure German renewable targets are met; and to allow for future Energiewende trends towards increased electricity use for heating and mobility. This roughly corresponds with February's onshore wind analysis by the economy ministry, which concluded that an average annual onshore installation of 4.1GW will be required in the 2016 to 2024 period, followed by an annual average 4.8GW in 2026 to 2035, assuming wind turbines operate for 20 years (see chart below). The BWE argues for four auctions per year, with participation of only permitted onshore wind projects, and a mechanism under which onshore wind developments can take place across the country and not just in the windy north. Such a mechanism could be that support rates are linked to a wind farm's performance in relation to its "reference" wind location, as under the current support. Wind projects at locations with wind speeds below the reference parameters could receive a higher rate of support for more months than projects at sites with wind speeds higher than the reference parameters. Alternatively, auctioning could be split geographically between northern Germany and central and southern Germany, a suggestion made in a study on auction structure for onshore wind, written by energy consultancy BET for the Baden-Wurttemberg environment ministry. The inland state is keen to build up a wind energy fleet in the region, but an auction system based on generation cost alone could see it go virtually empty-handed. The German wind association also argue vehemently in favour of the de-minimis arrangements - so far ignored by the German government - to ensure small players can continue to participate in the sector. This may require a clear definition of small players, such as an annual revenue threshold and number of employers, to ensure large players cannot simply divide larger projects into small units, he noted. 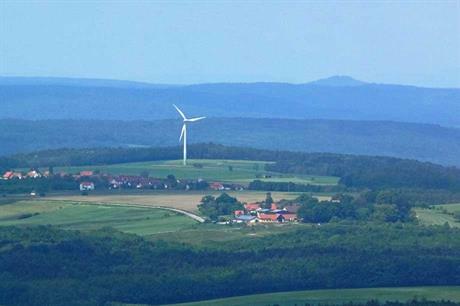 Small investors have played a major role in German wind development. About 15% of the national fleet of 25,277 turbines consists of single-turbine projects, 35% of wind farms with up to three units each, and 60% of all turbines are in projects of up to only six turbines, according to an economy ministry onshore wind analysis released in February. As the wind sector waits for the outcome of intense debate on auctioning, the German government's white paper on the electricity market for the Energiewende, released in July, reveals little on what is to come. Its only clear comment is the importance of plenty of onshore wind sites to ensure there is competition and, at the same time, the need for high security of investment to keep capital costs low.